We are manufacturing and supplying Diffrent Extrusion machines. Our machines are capable of giving 100% output. We are manufacturing various models as per the client production output require. 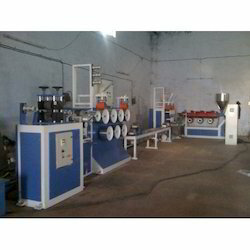 We can also able to provide diffrent extrusion machine like T-die sutli plant and blown film type string/ sutali plant. 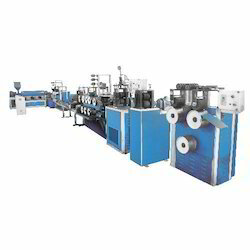 Box strap extrusion machine, pp strap extrusion machine,HDPE strap Extrusion machine,and PP monofilament extrusion machine,HDPE Monofilament Extrusion machine. Auto chhese winder is provided in different width of coil as per the requirements of coil width of 40 mm, 50 mm, 60 mm, 100 mm, 150 mm, and 200 mm. Options are vailable in screw dia of 40 mm, 50 mm, 65 mm, 75 mm, and widely used for loose packaging, tieing of bags and twisted rope making.which are suitable for PP synthetic jute. Capitalizing the skills of our professionals, we are offering a quality assured assortment of Sutali Plant. The Sutali Plant is recommended amongst the clients for its durability and reliability. Offered products are highly reliable and known for its durability.Offered products are highly demanded amongst the clients for its unique appearance. These products are designed as per the requirements of the clients. Moreover, our products are designed as per changing requirements of the clients. Besides, offered products are available at reasonable rates. Backed by a team of well qualified and experienced professionals, we are engaged in offering a wide array of HDPE Strap Extrusion Machine to our respected customers. Manufactured in compliance with the industry guidelines, these machines have helical gear box with an inbuilt thrust bearing and inbuilt single color printing unit. Apart from this, we are offering these products within the committed frame of time. We are offering Plastic Sutli Plant to our client and our product is made of good quality. 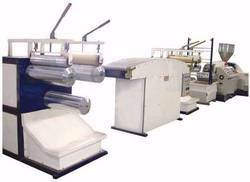 With the valuable assistance of skilled team of professionals, "Archana Extrusion Machinery Mfg. "e offering an extensive range of high quality PP Sutli Plant. The offered sutli plant is used to produce the synthetic string that finds its application for packaging various goods.